Kurma or Korma is a type of smooth silky gravy with meat/egg/vegetables/paneer. Kurma/Korma belongs to Mughlai cuisine. But the taste slightly varies from state to state. The recipe which I'm going to share today is South Indian type, which is flavoured with curry leaves and coconut. The Kurma/Korma gravy should be slightly sweet in taste and rich in flavour. In any kind of party, occasion you may prepare this dish. I'm sure your guests will be super happy with the dish. Let's have a look into the recipe. Heat a small pan, add all the ingredients mentioned under the heading "Kurma Masala', dry roast for few seconds till a nice aroma comes out. Let the roasted masala cool down completely and grind to make a fine powder in a grinder. Cover the 'Kurma Masala' & keep aside for later use. In the meantime, take the Scraped Coconut, Green Chili & Cashew in a small grinder, add 2 tablespoons water (I used the coconut water) and grind to make a smooth paste. Keep aside the paste. Now take a non-stick pan, heat oil & ghee together. 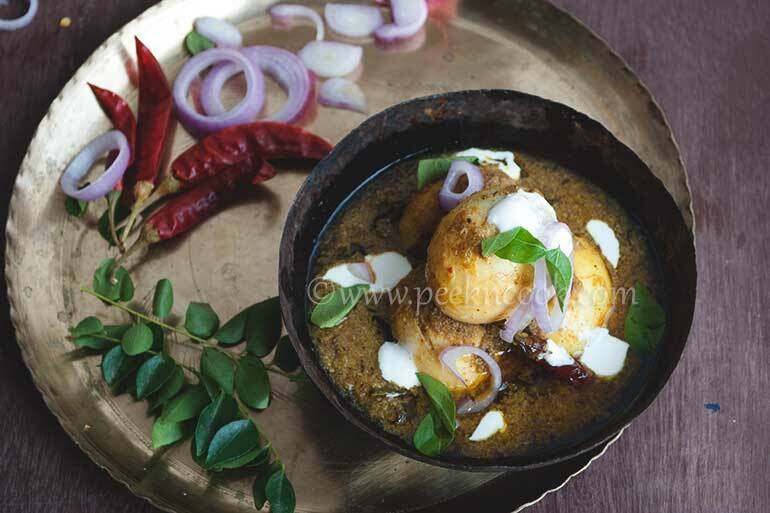 You may use only oil or only ghee to make the dish. Temper the oil with Shahi Jeera, curry leaves & whole red chili. When a nice aroma comes from the tempering, add Onion paste. Fry till the onion becomes light brown. When the onion paste changes the colour, add Ginger Garlic paste and the 'Kurma Masala'(which we made at the beginning), sprinkle some water and fry for few seconds. Now add the 'Coconut paste' and again fry till oil separates from the spices. Add the Hard Boiled Eggs into the pan and mix with the spices. Add the warm water, salt & sugar/honey and let the gravy boil on low heat for 2 minutes. After 2 minutes add the Fresh Cream and again boil for few minutes till the gravy thickens. Turn off the heat when the gravy thickens and becomes silky smooth type. Sprinkle some fresh cream, ghee & chopped cilantro on the gravy and serve with Indian Flat Bread or Flavoured Rice.